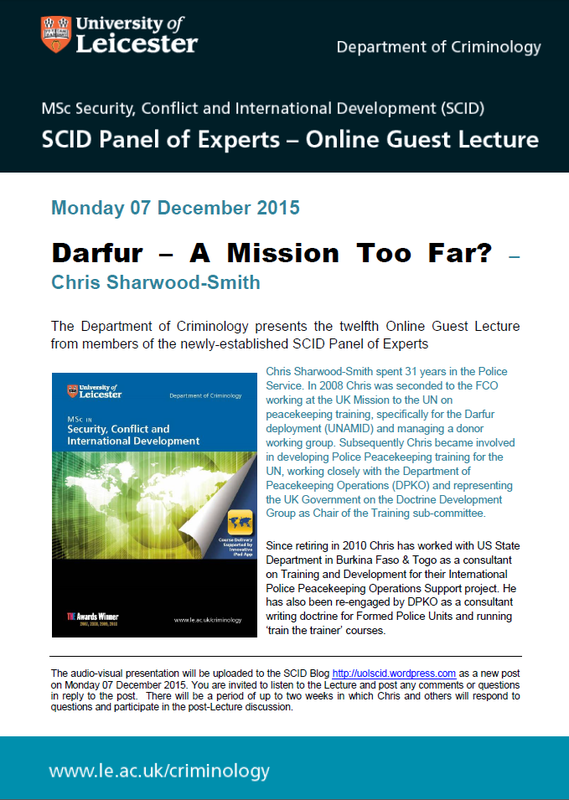 SCID Panel of Experts – Online Guest Lecture – Mr Chris Sharwood-Smith – Darfur: A Mission Too Far? This is the 12th Online Guest Lecture by members of the SCID Panel of Experts. Mr Chris Sharwood-Smith presents a lecture entitled Darfur: A Mission Too Far? This entry was posted in Africa, peacebuilding and tagged Africa, African Union, AU, Darfur, Mr Chris Sharwood-Smith, Sudan, UN, UNAMID on December 7, 2015 by uolscid. Thank you, Mr Sharwood-Smith, I found this presentation extremely informative. The mission seems nothing short of a logistical ‘perfect storm’. I am wondering whether you might please shed additional light upon some of the issues associated with contractors as cited in your presentation. •	Were the contractors themselves local in origin as a condition of their approval by the Government of Sudan? And if so, were they operating, at least in part, on behalf of the Government of Sudan? •	Were the contractors the ‘victims of loss’ or the ‘likely perpetrators’ of the missing equipment referenced in the presentation? •	What sort of equipment went missing – and did its acquisition in the shadow economy help contribute to the power structure of those in conflict (thus contributing to further destabilisation and threat to civilian life)? •	Were the contractors also helping move supplies for either the militias or the Government of the Sudan? •	Given the scarcity of goods – and the frequently delayed arrival of supplies – did any mission members feel obliged to purchase items from a shadow economy? Thank you for any consideration you might lend these questions. – There is no evidence to suggest that the contractors were anything other than victims, although there was occasional speculation that some may have been complicit. – Almost anything was lost when vehicles were raided or hijacked, it is difficult to evidence if it ended up back in the power structure of the conflict but it is my suspicion that at least some of it did. – I am not aware that the contractors were working with the militias but as they were local contractors it is quite possible that they also carried contracts with GoS. – I am not aware of any Mission members feeling obliged to purchase items from the shadow economy, there was frustration over lack of equipment but I do not think that anybody would have taken such a drastic step. I have enjoyed learning from you and remain most grateful you have shared your time, experience and expertise.